Four in 10 Minnesota workers face a choice between showing up for work sick and forfeiting a day’s pay. What’s more troubling, most of the 1.1 million Minnesotans who lack access to earned sick time off work in low-wage jobs. Those are among the findings of a report on earned sick time benefits, released today by TakeAction Minnesota and the Institute for Women’s Policy Research. The report bolsters growing momentum for legislation to increase Minnesotans’ access to earned sick benefits. Earlier this week California lawmakers passed a new law requiring employers to provide a minimum of three paid sick days per year to employees who work 30 or more days in a calendar year. Labor-endorsed lawmakers have expressed an interest in advancing a similar bill when the Minnesota Legislature convenes next year. Proponents say such legislation would benefit not only low-wage workers, but public health as well. That’s because the Minnesotans least likely to have access to earned sick time work in service jobs – food service, accommodations and other occupations that bring workers into frequent contact with the public. Just 35 percent of service workers in Minnesota have access to earned sick time off, according to the report. Employers have an incentive to support earned sick time benefits as well, Milli added. “Employees are happier when their employers provide them with these benefits,” she said. “They’re more productive. They’re less likely to voluntarily quit their job in search of new work. 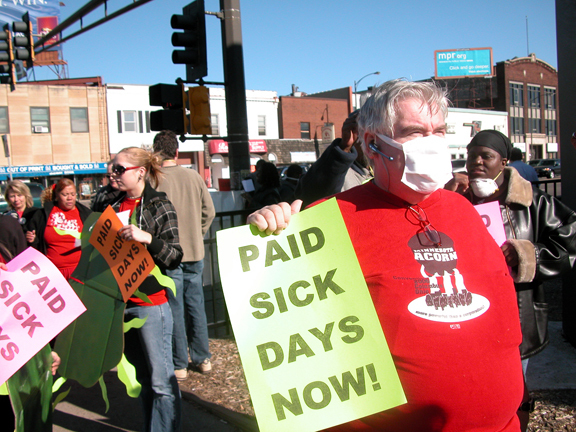 Greta Bergstrom, communications director for TakeAction Minnesota, said the statewide network of progressive activists and organizations will lead the campaign to pass earned sick time legislation at the Capitol next year.